LONDON (Reuters) - European shares were hovering at 5-1/2 year highs on Friday as a third weekly gain on the spin for Portuguese and Spanish bonds fed improving sentiment in the region's Mediterranean rim. 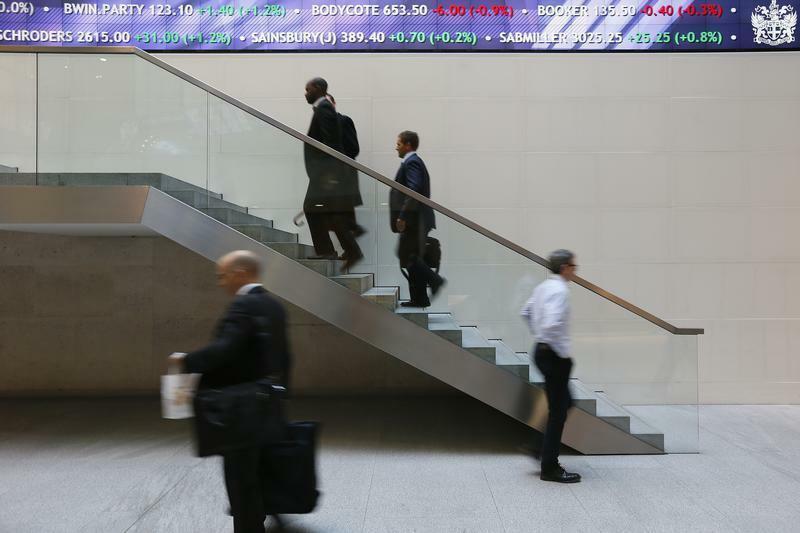 Some disappointing results from some of Wall Street's big names on Thursday had flattened the mood of investors overnight but hopes that U.S. data later will paint a brighter picture put a spring back in the step of the dollar. The dollar index, which tracks the greenback against a basket of six major currencies, was grinding higher at 81.006 (.DXY) with it flat against the yen, but up against both the euro and sterling. After another week of steady progress, European shares were also creeping higher. London's FTSE (.FTSE), Paris's CAC 40 (.FCHI) and Frankfurt's Dax (.GDAXI) for once outshone recent star-performing bourses in Portugal, Italy (.FTMIB) and Spain (.IBEX). "People are mainly looking at where earnings are going after lots of disappointing earning in the U.S. last night. There is lots of talk about a correction coming up, (but) I still think underlying sentiment is good," said Neil Marsh, a strategist at Newedge. Euro zone bond markets meanwhile were taking a breather after a third week of strong gains by Portuguese and Spanish government bonds. "It might be a temporary lag today," said ICAP strategist Philip Tyson. "I wouldn't expect it to last. The sentiment in the periphery is good," he added. Adding to the upward pressure on bond market yields was a third spike in as many months by overnight euro money market rates. At 0.3 percent they were sitting above the 0.25 percent ECB main rate that normally acts as their ceiling. The ECB will say at 1100 GMT how much more of the ultra-cheap 3-year loans it handed out at the height of the crisis, banks plan to pay back next week. Almost half of the original 1 trillion euros lent out has already been handed back and further big repayments are likely to push up market rates and increase the pressure on the ECB to bring them back down. "Money market rates ... continue to see upward pressure, as liquidity conditions gradually tighten, which will put more pressure on the ECB to make a move," said Jan von Gerich, chief fixed income analyst at Nordea in Helsinki." In Asian trading, share markets had a subdued day after disappointing earnings on Thursday from Wall Street giants Goldman Sachs (GS.N) and Citigroup Inc (C.N) had dampened the mood. A batch of U.S. data due later includes December U.S. housing starts, building permits, industrial production and the University of Michigan sentiment index, all of which investors will be hoping will paint a brighter picture. Among commodities, U.S. crude futures rose 0.5 percent to $94.50 a barrel, not far from a two-week peak of $94.64 reached earlier this week after U.S. government data showed a larger-than-expected drop in inventories. They were set to post their first weekly gain in three weeks. Gold was steady at $1,241 an ounce. However, it was nickel that caught the eye as despite a dip on the day, Indonesia's recent ban on ore exports left it heading for its biggest weekly rise in almost a year.